Dunkin' Donuts, America's source for gratuitous sugar and carbohydrate intake, is on a quest to find its "donut mojo." In August, the company revealed an experimental re-branding strategy that could see its name change from Dunkin' Donuts to just "Dunkin,'" but it turns out the high-profile donut news doesn't get any sweeter from there. The company recently announced plans to significantly reduce the number of donuts it serves by the end of October, shrinking its menu in some locations from 30 different kinds of donuts to 18, according to a report by Nation's Restaurant News. The impetus, according to Brand President of U.S. and Canada David Hoffman, speaks to the heart of an ethereal concept called "donut mojo," which has nothing to do with Austin Powers, but is apparently lacking in stark quantities when it comes to the ubiquitous chain. Hoffman said the company has already been shrinking the menu size of various stores in select markets, and Dunkin' is pleased with the results so far: “We’ve shrunk the amount of donut variety and we’re seeing a lift in those markets instantly,” he said, per the report. While a reduction from 30 to 18 donuts might seem like robbing your local outpost blind of its plentiful bounty, the executive explained that some stores will still serve 24 donuts after the purge is complete. Speaking in the parlance of a true donut-hawking empire, Hoffman called the company's strategy part of an "overarching reset" that should help the chain get its groove back after getting lost in the woods. Part of that reset, Hoffman maintained, comes with emphasizing more artisanal offerings that could see Dunkin' compete with fancy, craft donut purveyors. 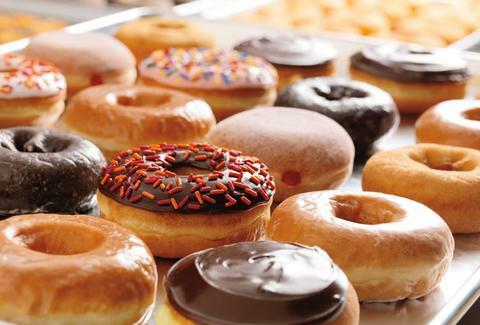 While donut aficionados are probably dying to know more about which flavors are on the chopping block, a Dunkin' Donuts spokesperson confirmed to Thrillist that the donut removals are only part of a "test," which is currently playing out at 1,000 stores nationwide. "The test locations will offer a minimum of 18 core donuts with the opportunity to expand based on consumer feedback and regional preferences," the spokesperson said in an email statement. "We believe this approach will provide a more consistent experience from store to store, and in some cases, will actually increase both the variety and quantity of donuts available to our guests. We will assess the results of the test before making any determination about a possible national rollout." At the moment, there's no indication that the changes will affect any other menu items, so don't weep for your bacon, egg, and cheese sandwich just yet. Dunkin' isn't the only national chain to embark upon a dramatic menu-slashing frenzy in recent weeks: Fast casual giant Chili's also cut 40% of its menu in order to focus on improving staple dishes while discarding some of its less popular items. For anyone disheartened by that news, the restaurant's Twitter account likely has a consoling message or two. Hopefully, the folks at DD will do the same.